'90s Cartoon Funky Chunky Magnets: Reptar, Ren & Stimpy, & More! | Nerd Much? ’90s Cartoon Funky Chunky Magnets: Reptar, Ren & Stimpy, & More! There’s no denying that the 90s got a lot of things wrong: No Fear shirts, bucket hats, and parted bowl cuts are just a few of the no-nos from the 90s. But the decade did provide us with something great: Saturday morning cartoons. Somehow, Saturday morning cartoons have gone by the wayside, but it used to be that you’d wake up at 6:00AM, grab a giant bowl of Cookie Crisp, and turn on the ABC and/or Nickelodeon station for a solid few hours of glorious cartoons. First, we had 90s Funko Pops announced earlier this year. We also know that there’s a 90s toon movie in the works. Now, you’re able to bring some of that ’90s nostalgia right to your kitchen thanks to 90s Cartoon Funky Chunky Magnets by Aquarius. There are some awesome ’90s magnets available, including a Reptar, Invader Zim, a Rugrats Photo, Ren & Stimpy, Rocco’s Modern Life, Transformers, and TMNT. You can also find Hey Arnold! and SpongeBob SquarePants if you prefer. These magnets have a bit of depth to them (they are chunky magnets after all), and they’re super beefy. They each vary with exact measurement, but they’re around the 3.5″ x 2.5″ mark. Might we recommend covering your fridge with each of the Ninja Turtles? 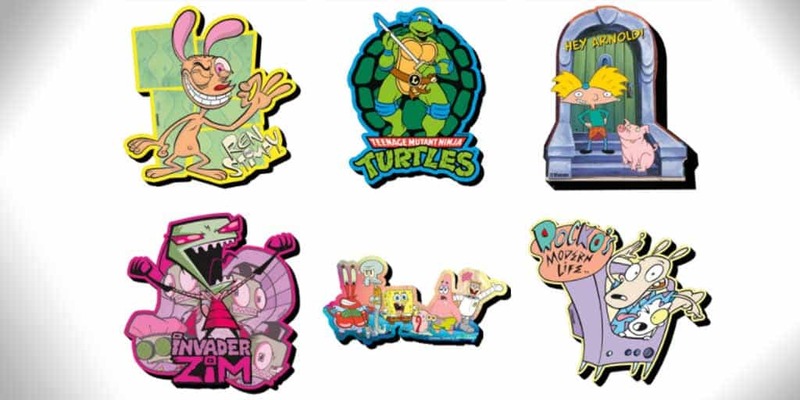 The line of ’90s nostalgia magnets are available for pre-order now at Entertainment Earth, and they’ll ship in August for $5.99 each. Buy the 90s Cartoon Funky Chunky Magnets here. Check out more cool nerdy stuff we find here at Nerd Much? on a daily basis.